Be a part of one of the most exciting and dynamic clubs in our school! Why join our Interact Club? We have fun while carrying out meaningful local and international service projects. We have opportunities to develop leadership skills and initiative while making new friends. We connect you with others in our school and our community. 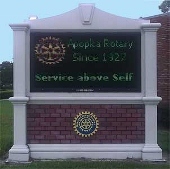 We are sponsored by the Rotary Club of Apopka and they provide us with many fun and educational opportunities. You have to be a member of our Rotary Interact Club to participate in the opportunities listed below. •	A tailgate party at 2 home football games for our club and our parents. •	A bowl-a-rama event for our club members. •	We are provided with counseling and mentoring in applying for scholarships, grants and college applications. •	Many community volunteer service hour opportunities. •	Participating in the Annual Apopka Fair. •	Participating in the Apopka Christmas Parade. •	We are provided with programs that teach us life skills. •	After 1 year in our club you can apply for one of 6 Camp RYLA scholarships. •	After 2 years in our club you can apply for an Apopka Rotary Interact College Scholarship. Interested? Contact Bill Spiegel at info@apopkarotaryclub.com.